Pure bliss is what I feel whenever I step into a bookstore. I love the sense of adventure and the possibility of discovering a book that will be impossible to put down, the sheer joy I feel because of all the choices in front of me. I could spend an entire day in a bookstore and be perfectly content. As a child books were my best friends. I was awkward and sensitive, an introvert (although I don't even think the term was common then), someone more comfortable with the companionship of a book to pass my days then the energy it took to navigate the mercurial world of grade school friendships. Place a book in my hands and I would sit for hours, immersed in a world of wonder. I had so many favorites. I keenly sympathized with Harriet the Spy when her friends discovered her notebook and gave her the big freeze, especially because she was at a loss at how to make things right again. While reading Little Women I didn't want to be Jo, like many of my friends, but rather Meg, the oldest, the sister who married the tutor next door. I think I read every Nancy Drew mystery ever written, never tiring of them. On weekends you would find me either curled up on a chair in a living room or stretched out on my bed, reading and dreaming. My books kept me company during the long summer months when my brother and I were left at home with a sitter while our parents were at work. There were mostly boys on our street and while I sometimes joined them in their adventures for the most part I was happier just sitting and reading. I will read pretty much any tome you place in my hands. Fiction, non-fiction, biographies, memoirs, my interests are far reaching. I rarely visit a bookstore without buying at least one book and the worst (best?) thing that ever happened was when I applied for a Barnes&Noble membership and could suddenly just go online, pick out a book and click 'order now'. There are piles of books next to my night table and on bookshelves throughout the house. I am always interested in the reading lives of others and have decided to begin a monthly series titled Book Talk. On the first Friday of each month I will feature an interview with a fellow lover of books to learn more about their reading lives. My guests will be varied: writers, artists, artisans and others. The questions asked will explore the role books have played in their lives, which authors have influenced their creativity, what is currently on their night stands and much more. I am so excited to announce that my first guest this Friday is the lovely and talented Michelle of the blog, Michelle GD. Michelle is a writer, photographer and teacher whose online courses include Just Five Things: Creative List Making and 28 Moments: Celebrating What is Yours (found at Brave Girls University). She is also a contributor to the blogs Viewfinders, Makings of Motherhood and Tandem Echoes. I know you will lover her as much as I do! 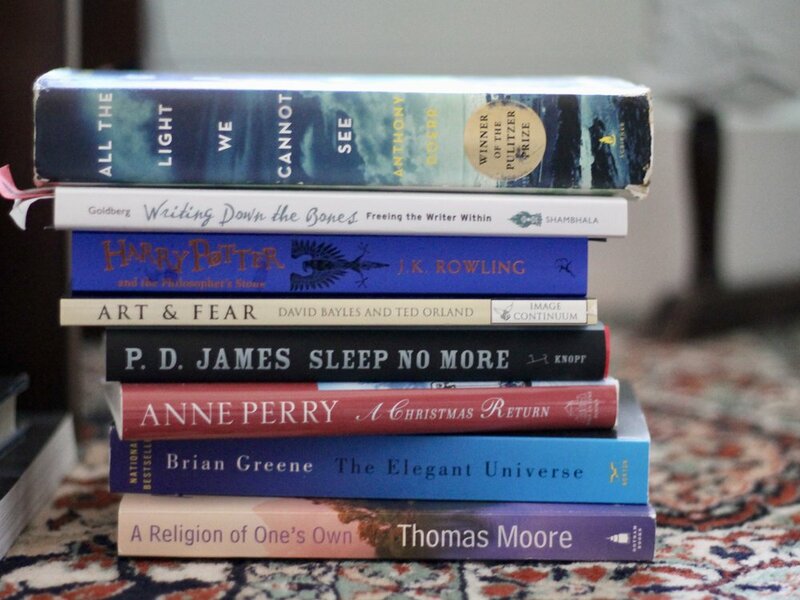 In the meantime, what is currently on your nightstand? I'd love to know!